"KUSHAN EMPIRE, Kanishka I. C. 130-158 AD. AE 1/4 Unit (17 mm, 4.31 g). Obv. : King standing facing beside alter, holding trident, control mark in left field; legend starting at 7:00 ShAO KA-NEShKI. / Rev. : Lunate moon goddess Mao standing; MAO to right; Tamgha to left." "Kushans. Kanishka I. Circa 127/8-152 AD. AV Dinar (7.93 gm, 12h). FAONANAOFAO KA-NHFKI KOFANO, Kanishka standing facing, head turned left, flames on shoulder, holding standard in his left hand, sacrificing over altar to left / BODDO, Buddha, nimbate, standing facing, wearing samghati (a long pleated garment), his head with eyes wide open and large moustache, ashnisha on head, urna between eyebrows, his right hand is raised in the gesture of reassurance, abhayamudra, and he holds a pleat of his robe in his left hand; tamgha to right." 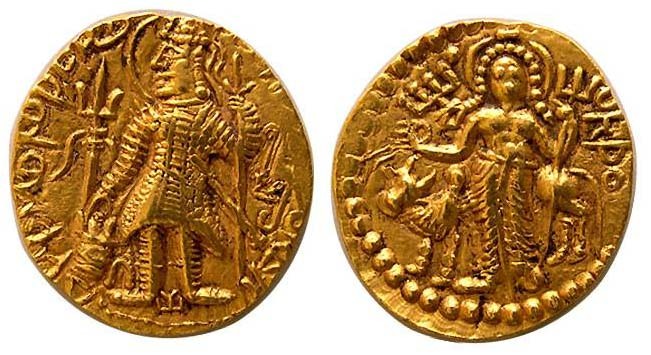 "Gold coin of Kushan king Kanishka I. c. 115-126 CE. 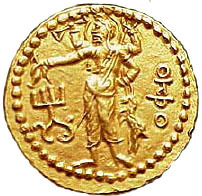 Obverse: Kanishka standing holding trident and sacrificing at altar. Reverse: Four-armed god Siva standing with trident." "Kings of Kushan. Kanishka II. Circa 200-222 AD. Gold Stater (7.92 gm; 20 x 21 mm). King standing left, holding trident, sacrificing at altar; symbols in field / Siva standing facing, the bull, Nandi, standing left behind." "Kanishka I AE tetradrachm, MIOPO (Mithra) reverse. 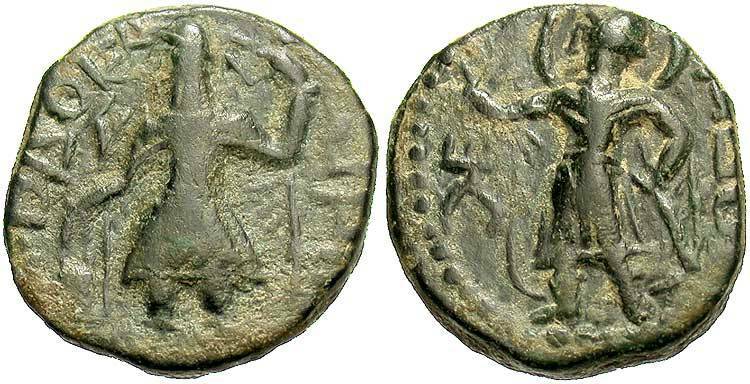 Obverse King standing facing, sacrificing at altar at left, holding sceptre in left hand, Bactrian legend around: ÞAO KANIÞKI (Shao Kanishki). Reverse Solar deity Mithra standing left, radiate and nimbate, holding out diadem, Bactrian legend at right: MIOPO, tamgha at left. Date c. 127-150 CE. Weight 16.98 gm. Diameter 26 mm." "Kanishka I. Circa 100-126 AD. AV Dinar (7.89 gm; 20 mm). Kanishka standing left, crowned and with flames at shoulder, with sceptre and sword, sacrificing at altar / MIIPO, radiate god standing left, holding sword; tamgha to left." "Kanishka I. Circa 127/8-152 AD. AV Dinar (8.00 g, 12h). Mint I (A). PAONANOPAO KA- NHPKI KOPANO, Kanishka standing facing, head left, holding goad over altar in right hand, standard in left; flame at right shoulder, annulet on cheek / MAO, the lunar god Mao, diademed with long fillets, lunar "horns" at shoulders, standing facing, head left, right hand extended in benedictional gesture and cradling globe-tipped sceptre in left arm; tamgha to left." "Bronze drachm of Kanishka I (ca.127/8-152 AD), Kushan Empire. 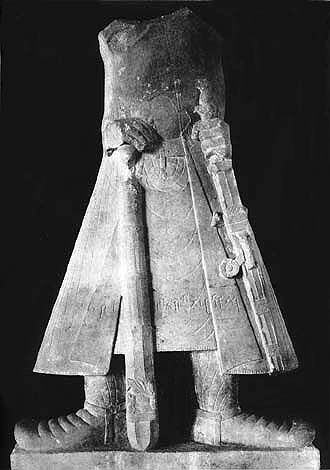 King standing left beside altar, holding trident. Bactrian legend. Control mark in left field / Goddess Nanaia, inscriptions in the left field. 18mm, 3.5 grams." " Kushan Kings: Kanishka I. Circa 127/8-152 AD. Gold Dinar (6.35 gm; 19 mm). Diademed and draped half-length bust of Kanishka left / Nana standing right, holding sceptre; tamgha to right." "Kanishka I Gold quarter dinar, Athsho reverse. 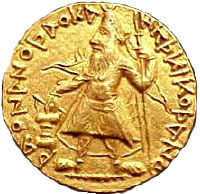 Obverse: King standing facing, sacrificing at altar at left,holding standard or sceptre in left hand, elephant goad in right, Bactrian legend around: ÞAONANOÞAO KA ... NIÞKI KOÞANO (King of kings, Kanishka the Kushan). 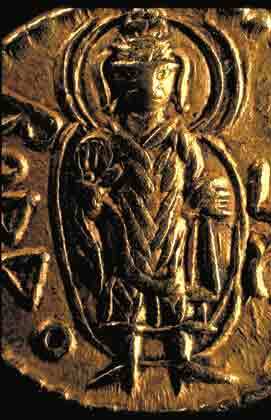 Reverse: God of metals Athsho standing left, holding out diadem, Bactrian legend at right: A?&Thorn;O, tamgha at left. Date c. 127-150 CE. Weight 1.95 gm. Diameter 13 mm." 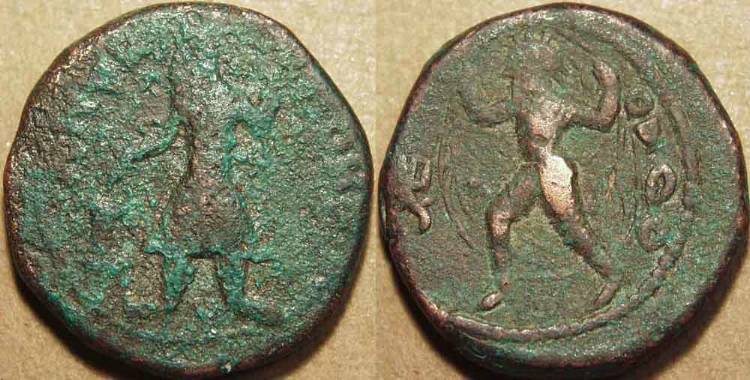 "KUSHAN: Kanishka I AE tetradrachm, OADO reverse. Obverse: King standing facing, sacrificing at altar at left, holding sceptre in left hand, Bactrian legend around: ÞAO KANIÞKI (Shao Kanishki). Reverse: Wind God Oado flying right, holding up his cloak to catch the wind like a sail, and hair flying to indicate his rapid motion, Bactrian legend at right: OA?O, tamgha at left. Date c. 127-150 CE. Weight 17.23 gm. Diameter 27 mm."